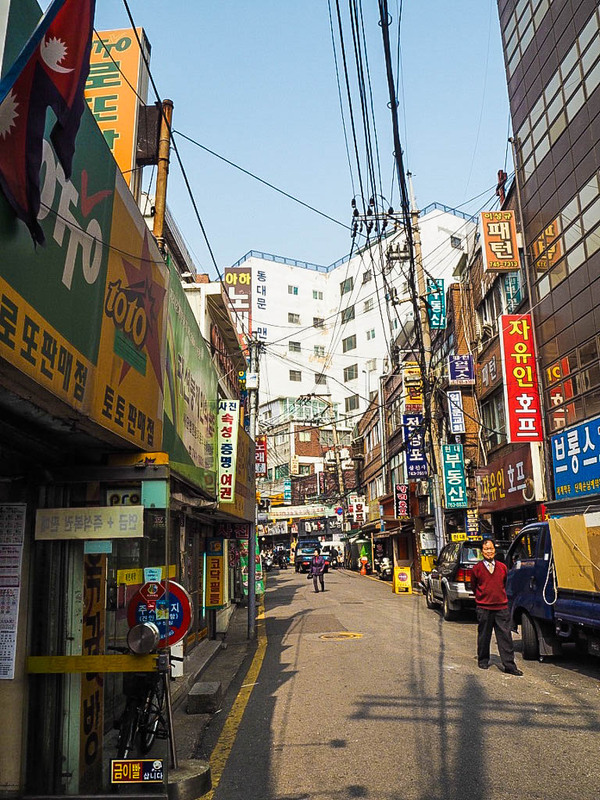 When I travel, I always research the restaurants I want to try, but when I’m in Asia it’s more what I’m going to eat rather than where. 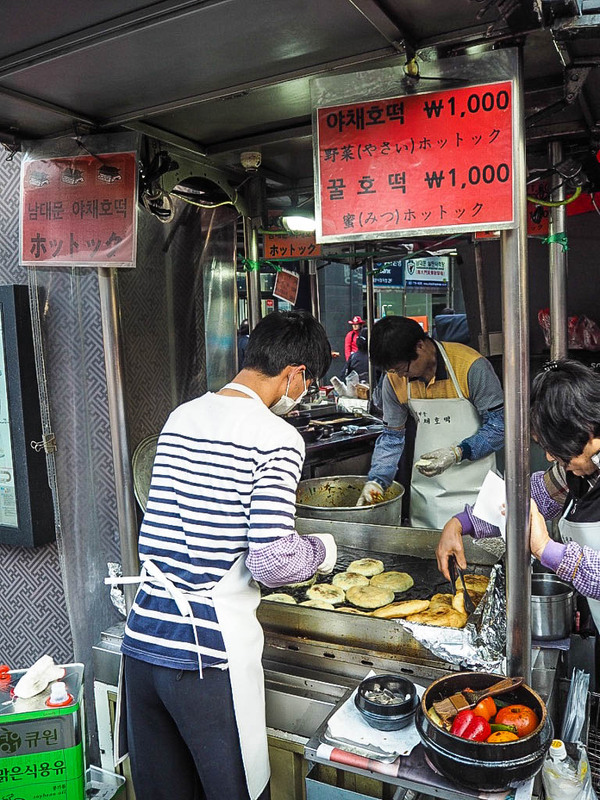 Street food is the staple of local life but to tourists it could be deemed a bit risky to eat from a tiny stall perched up on the side of the road. 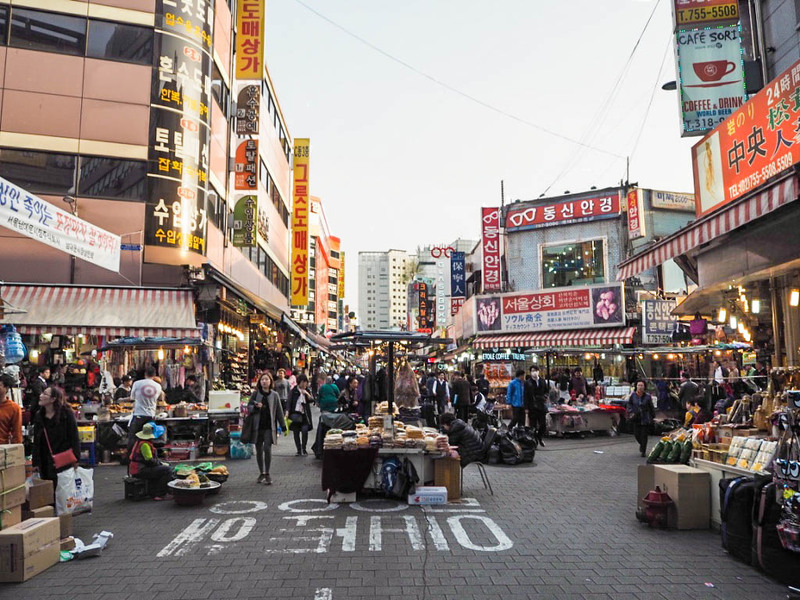 Most of Asia’s most famous delicacies can be found in this way, from hamburgers in Xi’an to satay in Singapore, so during my visit to Seoul I sniffed out everything I could to find the best of what South Korea had to offer. 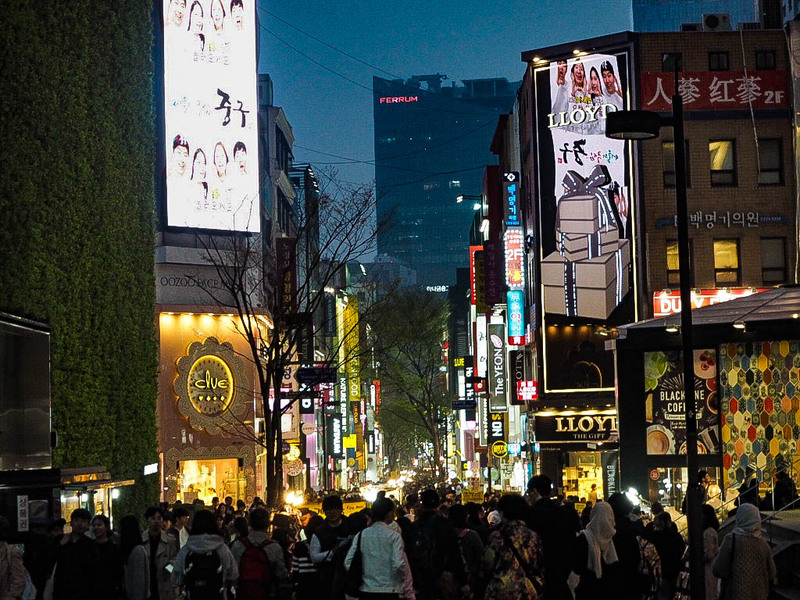 A stone’s throw from my hotel, I found the street of Insadong, bustling and busy with traders, locals and bewildered tourists. 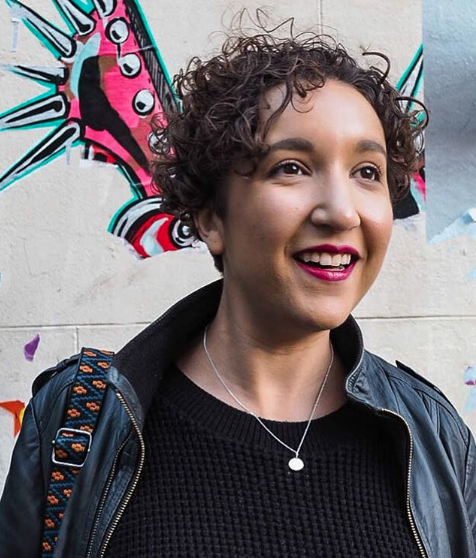 Spotting a tiny food stall with a mid-sized queue, I knew where I needed to be, and despite having no idea what I was ordering, I paid my way and took a risk. 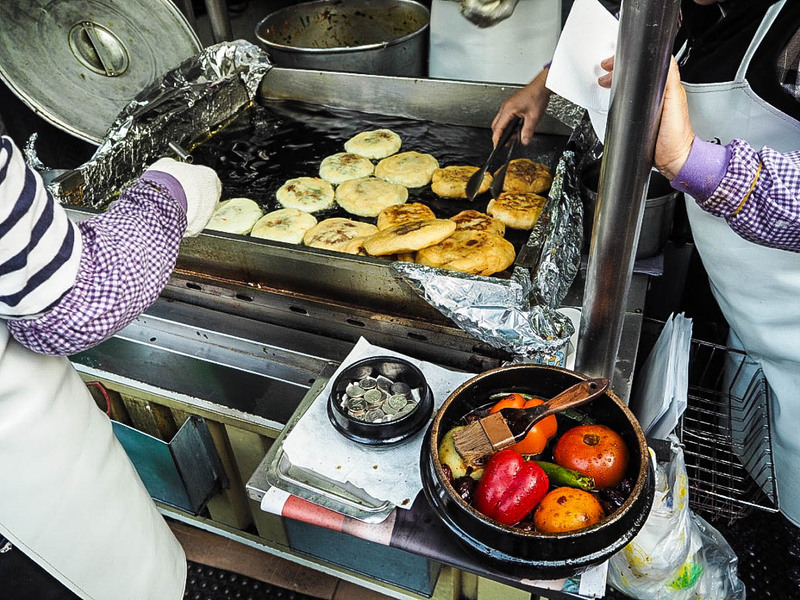 A hotteok, or hodduk, is a fried, stuffed pancake. Usually filled with cinnamon, sugar and other sweet options, this one was actually savoury and stuffed to the brim with glass noodles. 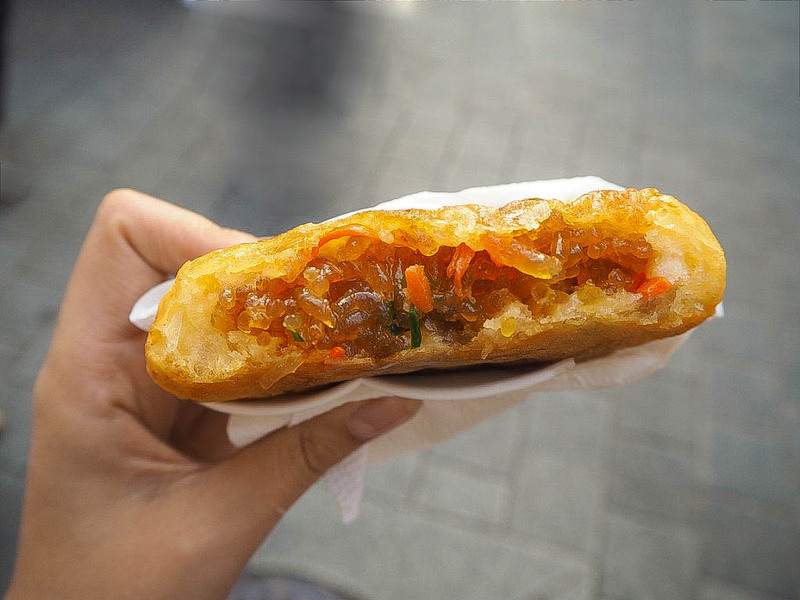 Crispy texture from shredded carrot and pepper inside, as well as the fried outer shell; I was expecting spice but none came. 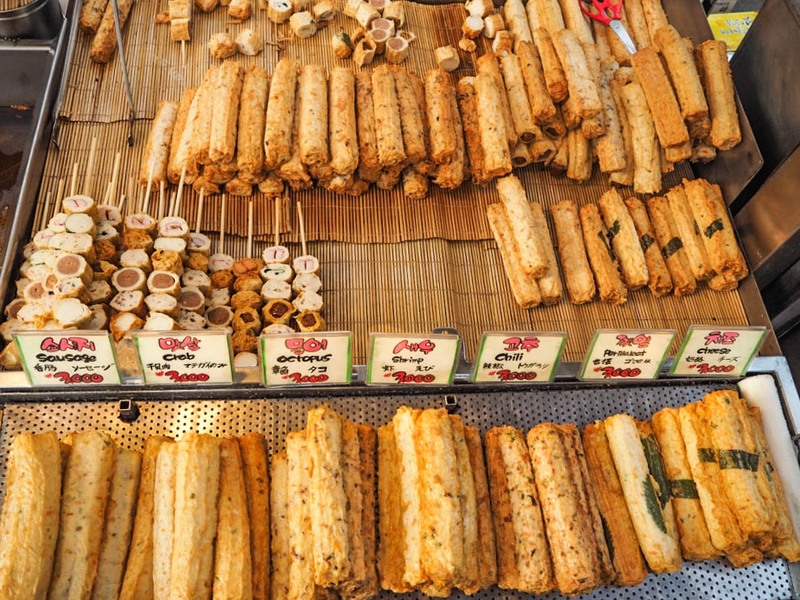 It was a strange variety of sensations, but felt totally unique amongst the other Asian street food I’ve tried. 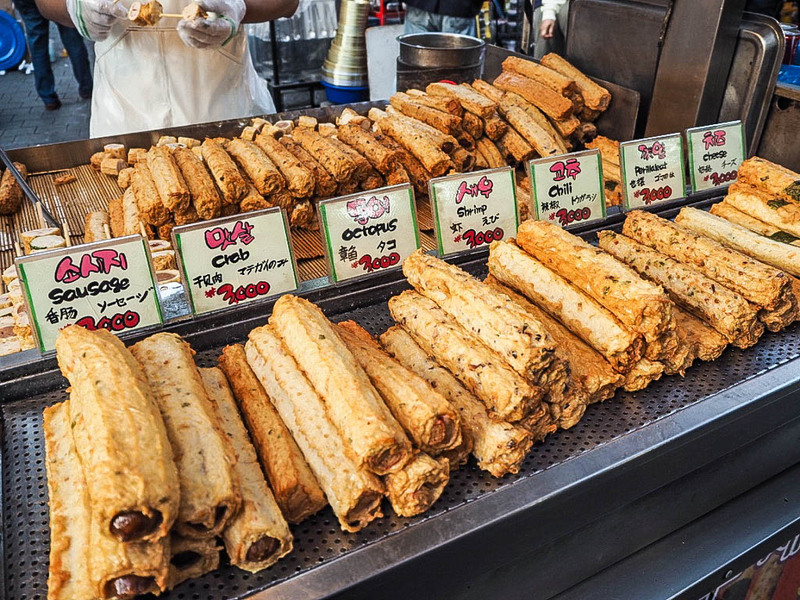 This is something that did not look appealing, and despite earlier saying that I don’t think street food is all that risky to eat, when it comes to seafood, I am ever so slightly more cautious. I’d first experience the concept of deep fried fish product in Chinese cooking; dunking them in spicy hot pot broths in both London and Chengdu. It is processed along with potato starch, sugar and vegetables, usually, but this version goes one further and deep fries it. I think the sausage versions are a bit more westerner friendly, but due to the intense heat from cooking I thought it would be safe enough to try a shrimp version. It certainly wasn’t the most delicious thing I’ve ever eaten, but for a snack on the go, it’s basically like having a hotdog in New York. 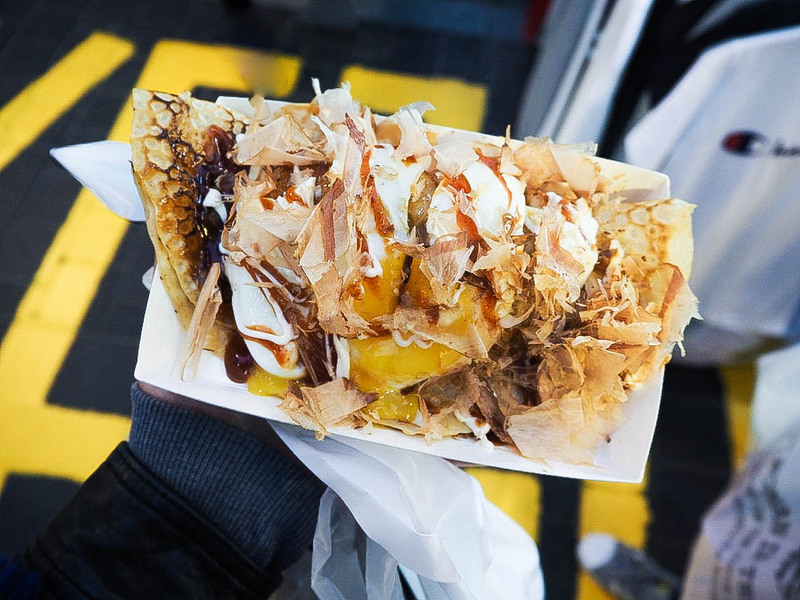 After an afternoon of cosmetics shopping on Myeongdong, I was drawn to the stall making okonomiyaki purely because the speed of which they were being churned out was totally mesmerising. 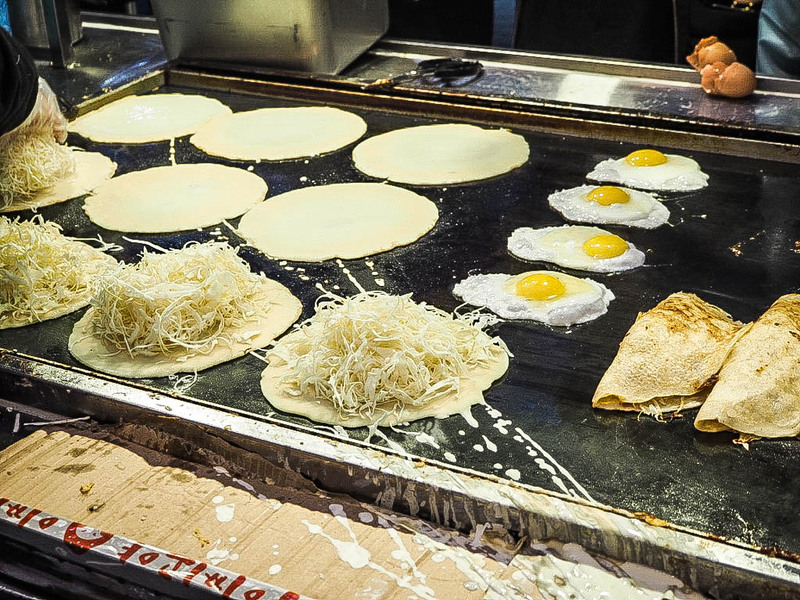 The batter was ladled onto a hot tray, flipped like a pancake and topped with shredded cabbage. Once cooked, they’re folded over, topped with an egg and then sliced up to make it slightly easier to eat (although walking and using chopsticks is something I haven’t quite mastered!). 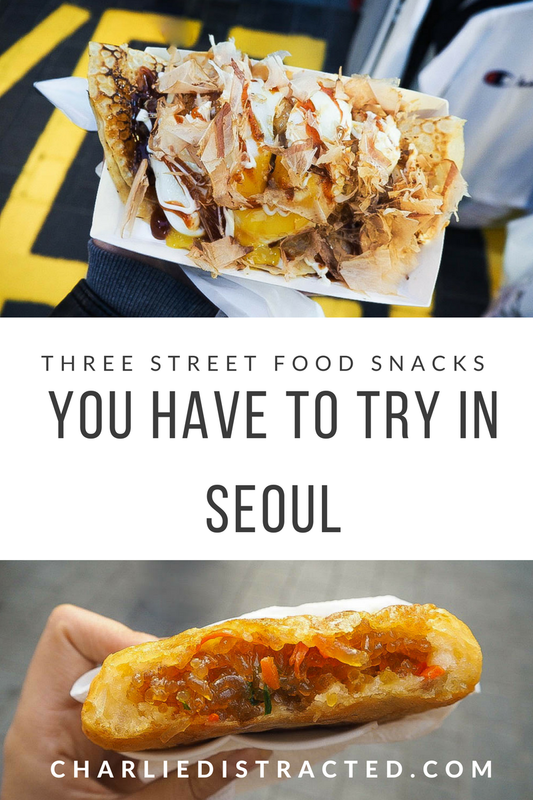 Topped with dried fish flakes, pickled ginger and a sweet, salty sauce, it was the best street food I had in Seoul, and as it is actually a dish native to Osaka, you can rest assured I will be hunting this down on my trip to Japan in September!